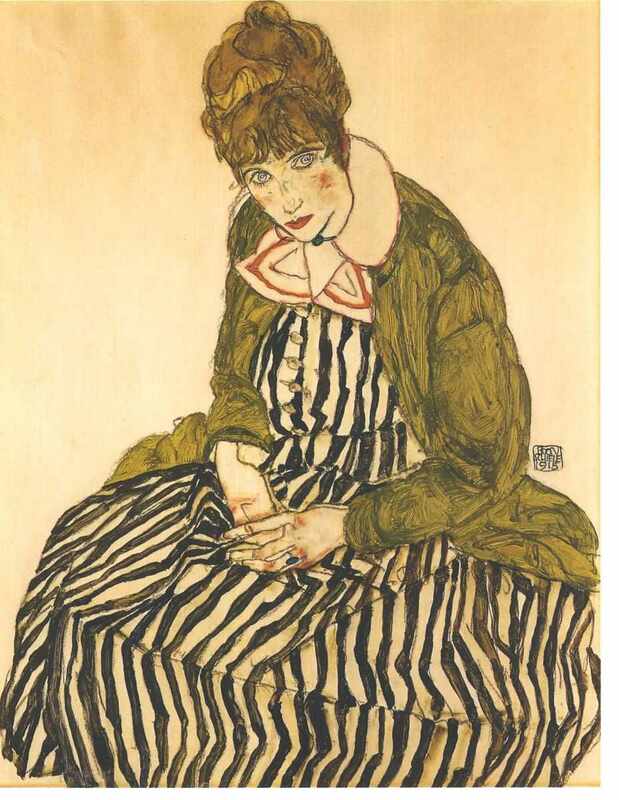 Egon Schiele died on the 31st October 1918. Three days prior to that he witnessed the death of his pregnant wife Edith. 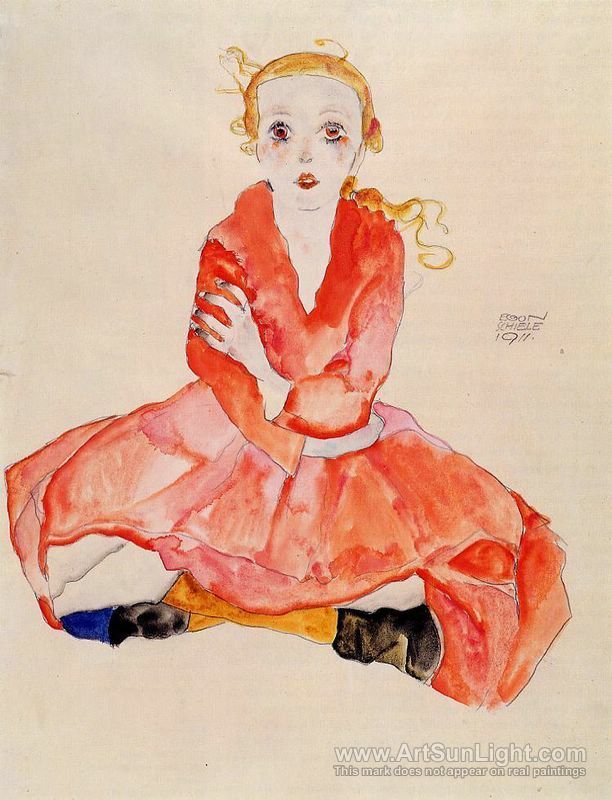 If it wasn’t for the Spanish influenza, she could have had their child and his prodigious mind could have produced many more drawings and paintings. 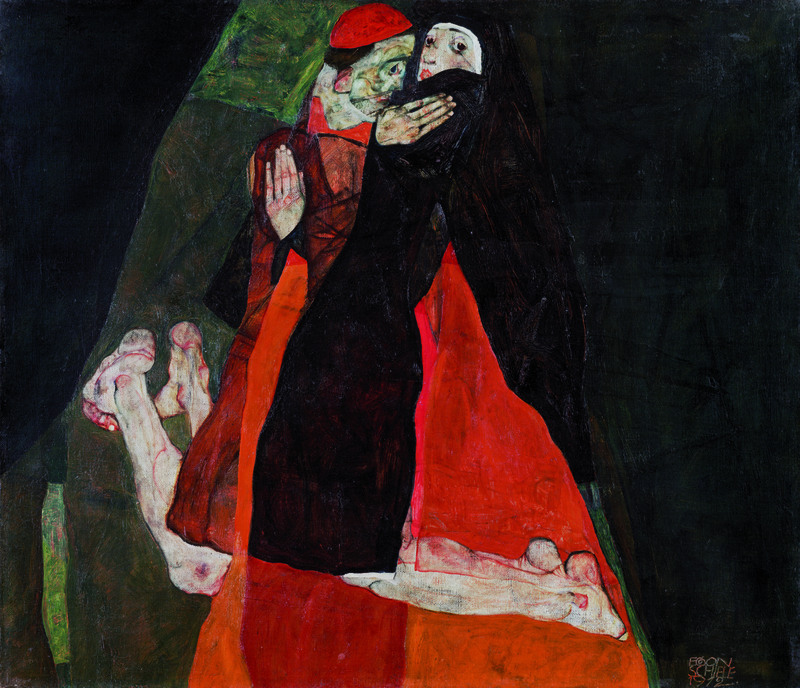 Painting “Death and the Maiden” is a very personal work and it connects and unites two themes that were a lifelong fascination to Egon Schiele; death and eroticism. 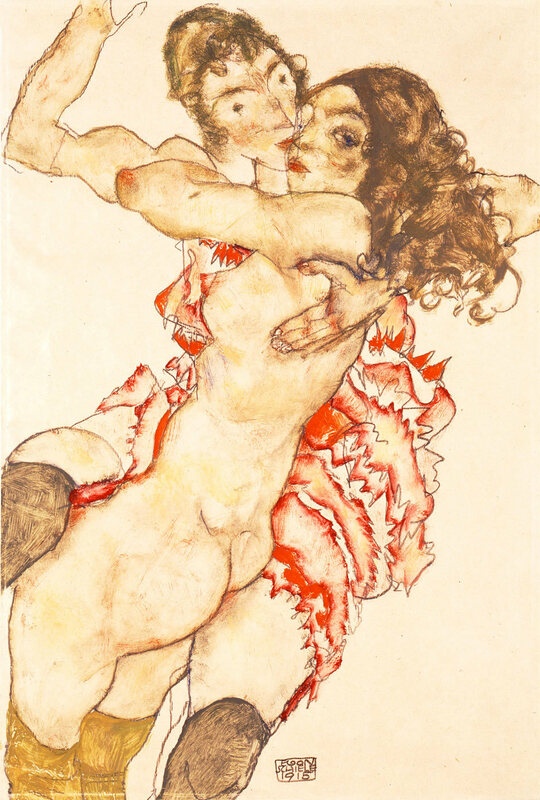 It shows two figures in an embrace, apparently seen from above, not unusual at all for Schiele to use such a strange perspective. They cling to each other in despair; painfully aware of the finality and hopelessness of their love. They are lying on rumpled white sheets, their last abode before the hours of love vanish forever, which simultaneously add a touch of macabre sensuality and remind us of the burial shroud. The background is an unidentifiable space, a desolate landscape painted in colours of mud and rust. 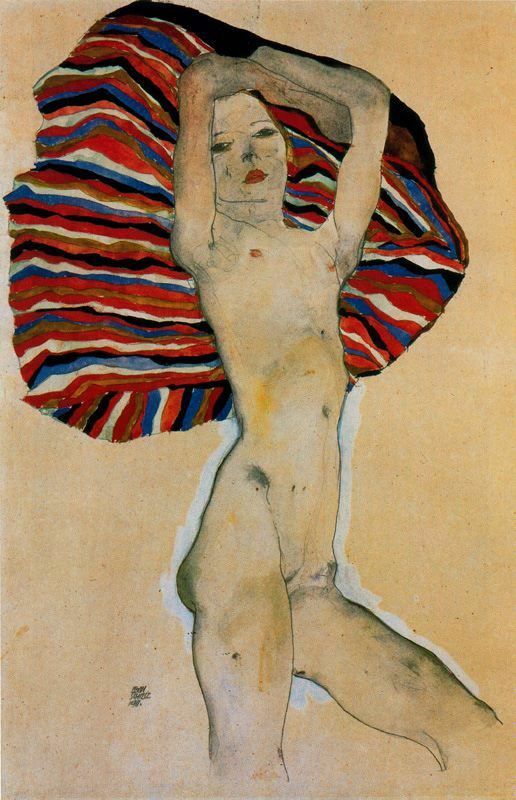 Death is a man not so dissimilar to Schiele’s other male figures or self-portraits, without the help of the title we couldn’t even guess that is represents death. 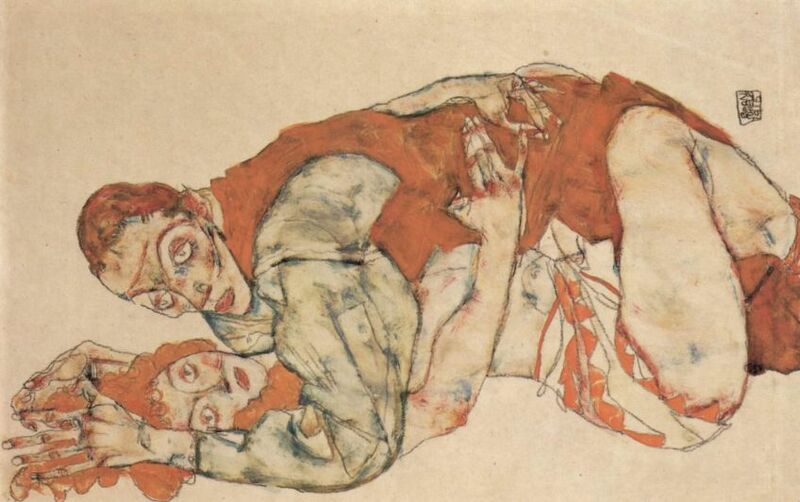 The red-haired woman hugs him tightly with her long arms and lays her head on his chest. She is not the least bit afraid of his black shroud of infinity. She holds onto him as if he were love itself, and still, her hands are not resting on his back gently, they are separate and her crooked fingers are touching themselves. We can sense their inevitable separation through their gestures and face expressions, and, at the same time, their embrace feels frozen in time, the figures feel stiff and motionless, as if the rigor mortis had already taken place and bound them in an everlasting embrace. 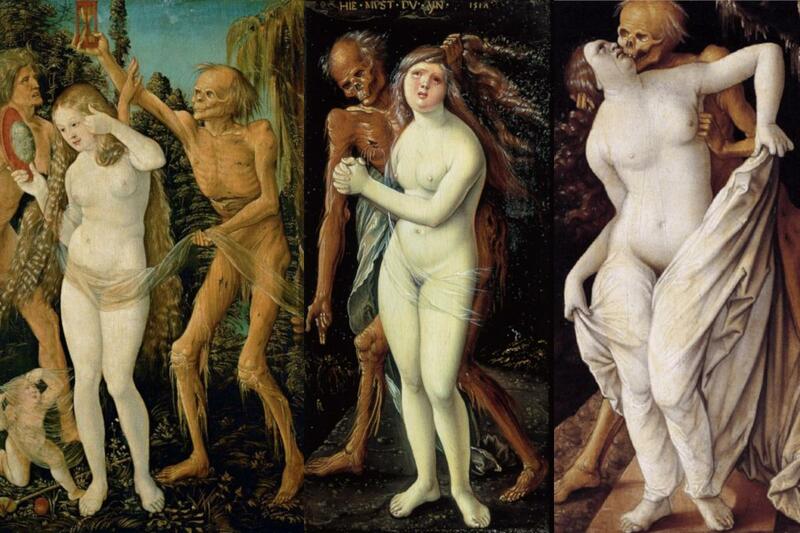 The maiden will not die, she will be clinging to death for all eternity. 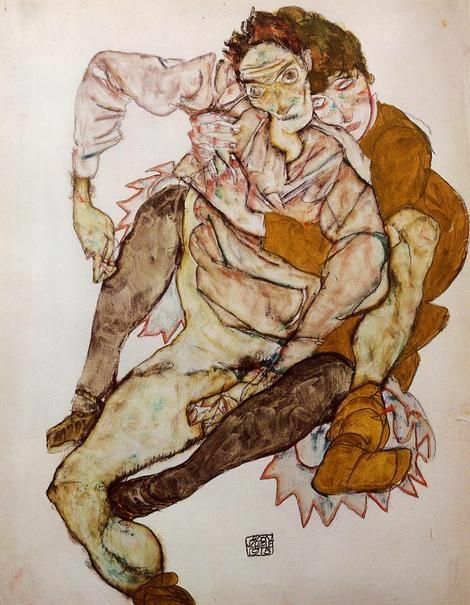 It is impossible not to draw parallels between the figures in the painting and Schiele’s personal life at the time. 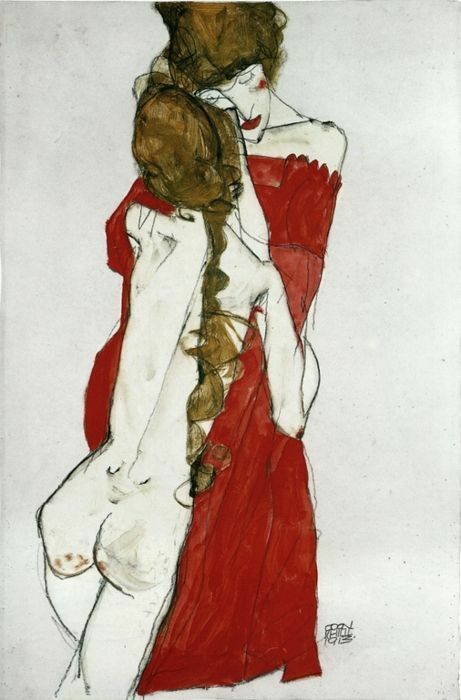 The figure of Death resembles Schiele, and we do all know he showed no hesitation when it came to painting and even taking a photo of himself, and the red-haired woman is then clearly Wally. 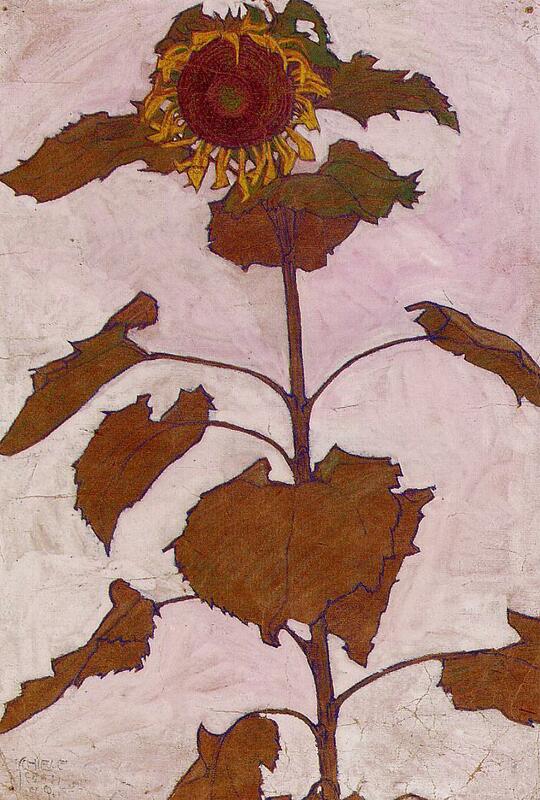 To get a better perspective at the symbolism behind this painting, we need to understand the things that happened in Schiele’s life that year. In June 1915 he married Edith Harms; a shy and innocent girl next door. 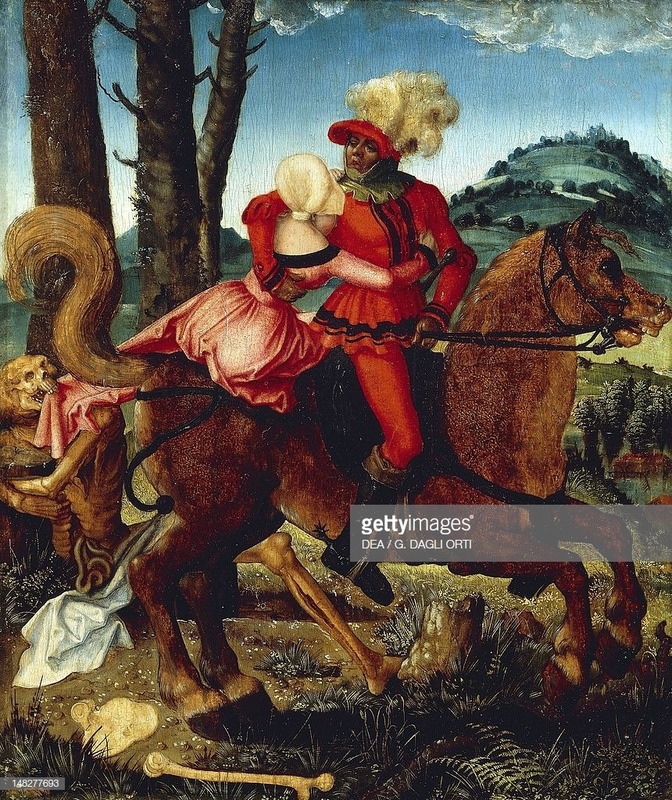 But first he needed to brake things off with Wally Neuzil, a lover and a muse who not only supported him during the infamous Neulengbach Affair but was also, ironically, an accomplice in introducing him to Edith. Upon meeting Wally for what was to be the last time, Egon handed her a letter in which he proposed they spend a holiday together every summer, without Edith. It’s something that Wally couldn’t agree with. Perhaps she wasn’t a suitable woman to be his wife, but she wasn’t without standards or heart either. There, in the dreamy smoke of Egon’s cigarette, sitting at a little table in the Café Eichberger where he often came to play billiards, the two doomed lovers bid their farewells. 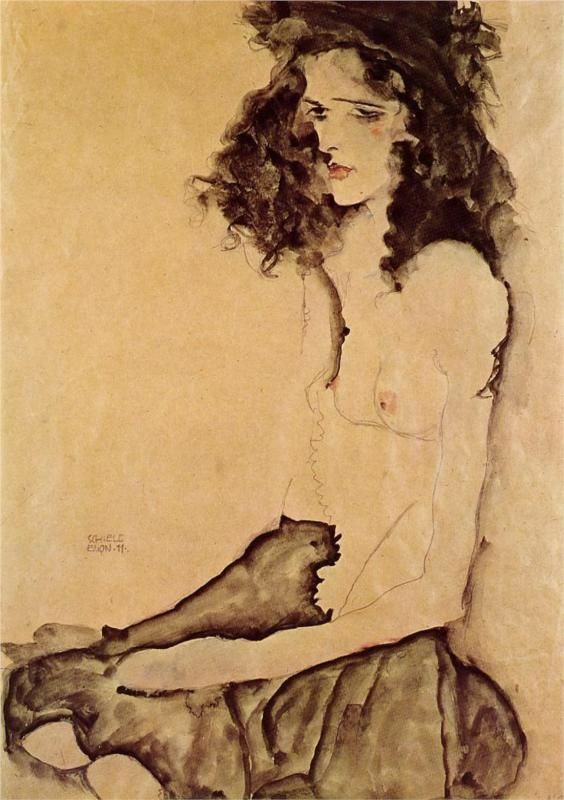 Egon gazed at her with his dark eyes and said not a word. He was disappointed but did not appear particularly heart-broken, at least no at first sight, but surely the separation must have pained him in the moments of solitude and contemplation, the moments which gave birth to paintings such as this one. 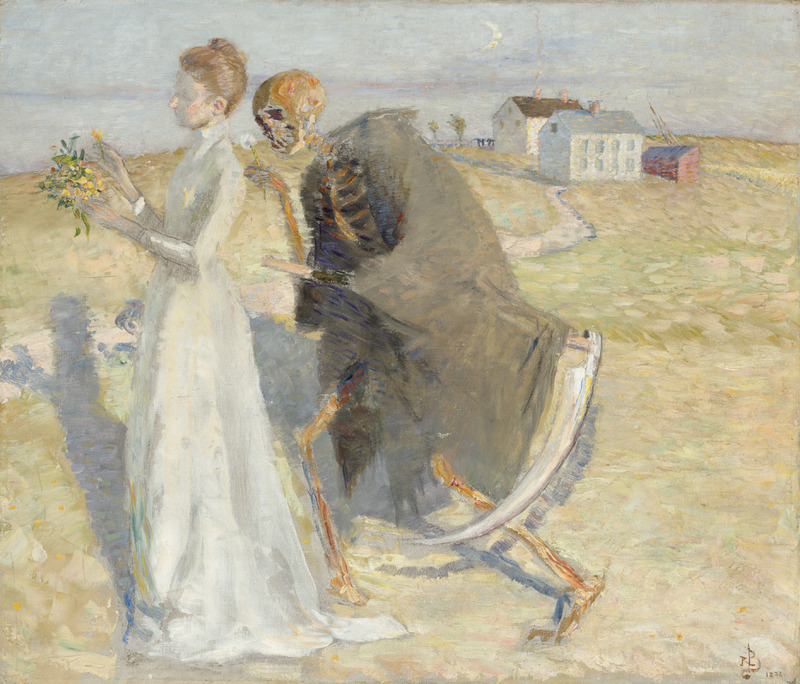 If we assume then that the painting indeed shows Egon and Wally, the question arises: why did he chose to portray himself as a personification of Death? He chose to end things with Wally, so why mourn for the ending? 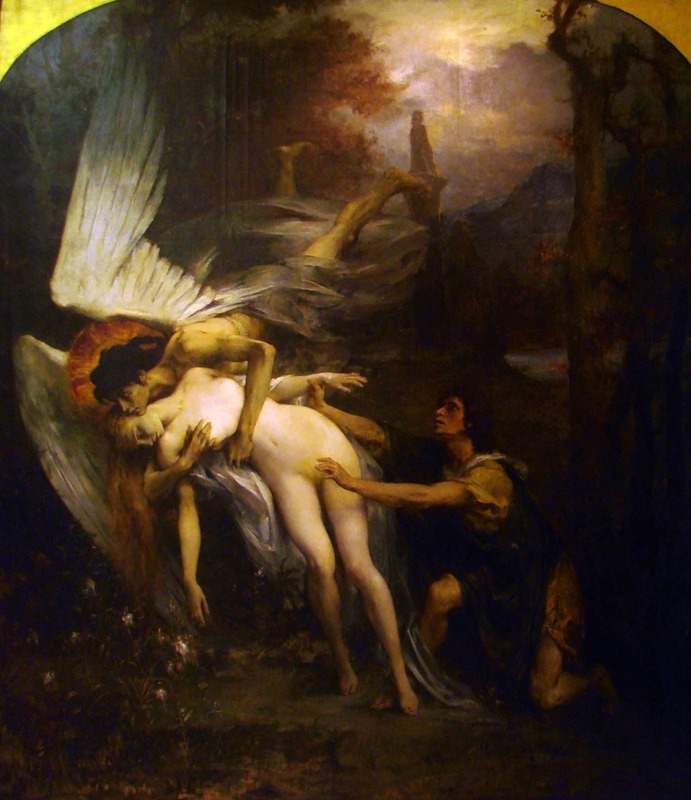 And shouldn’t Death be a possessive and remorseless figure who smothers the poor delicate Maiden in his cold deadly embrace? 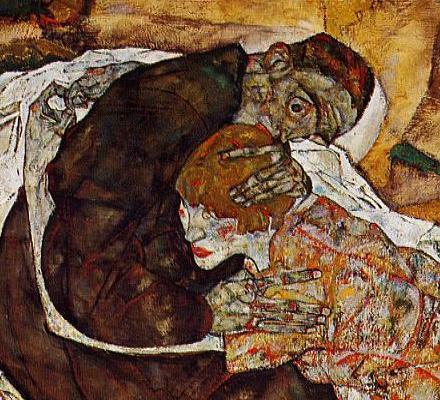 Schiele’s embrace in the painting seems caring and his gaze full of sadness. 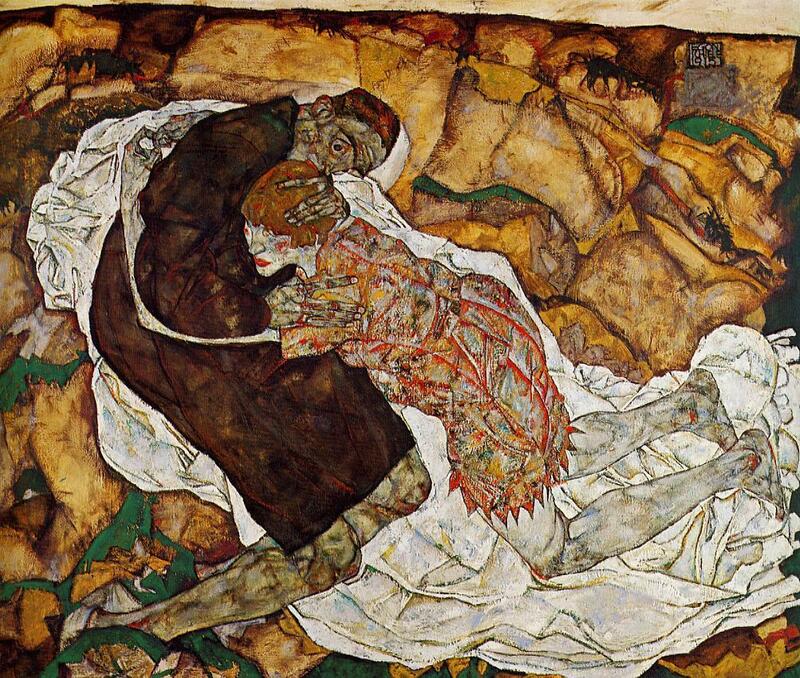 In this painting Schiele used the old theme of Death and the Maiden and enriched it by adding an introspective, private psychological dimension. 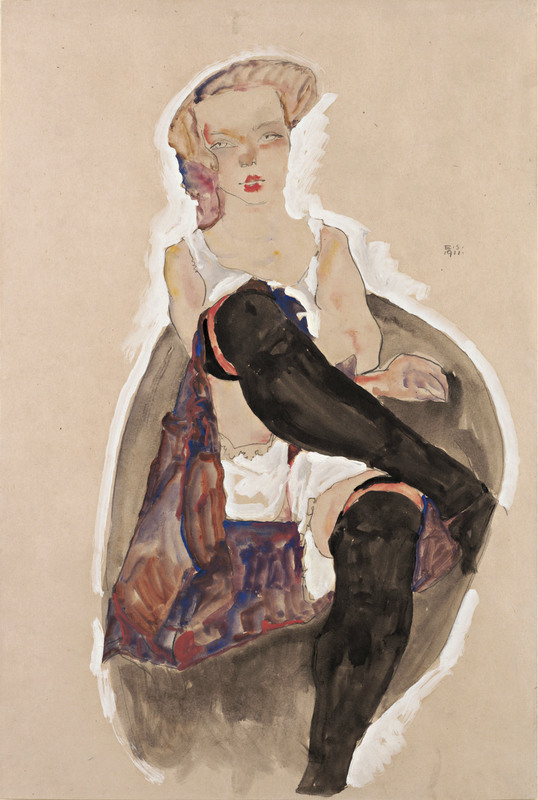 Schiele’s rendition of the theme isn’t a meditation on transience and vanity as it was in the works of Renaissance masters such as Hans Baldung Grien; a gifted and imaginative German painter and a pupil of Albrecht Dürer. 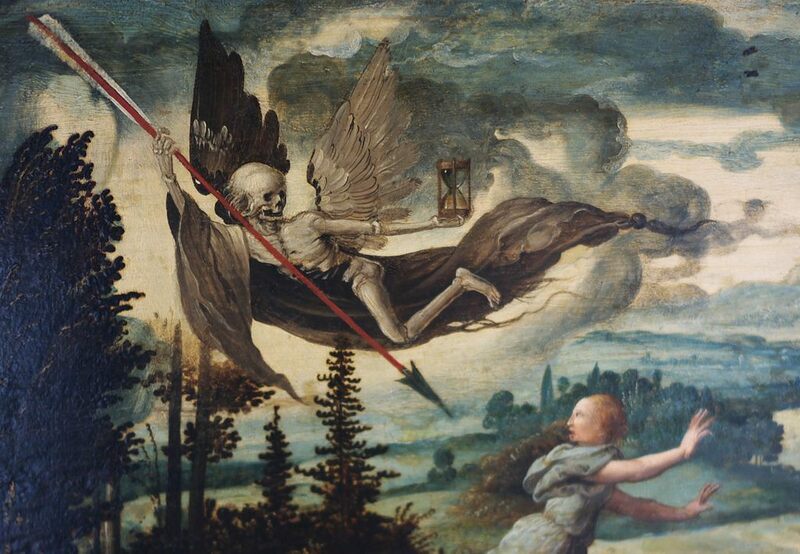 Grien revisited the theme of Death and the Maiden a few times during a single decade, at the beginning of the sixteenth century. 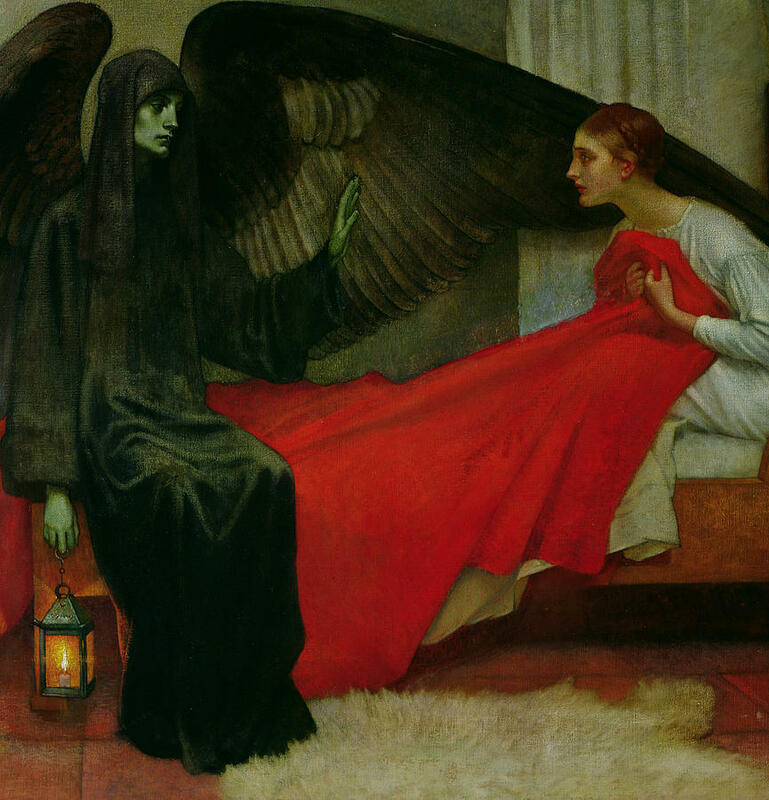 These paintings always feature a beautiful and something vain young woman (she is looking at herself in the mirror) with smooth pale skin and long golden hair, and a grotesque figure of Death looming behind her like a shadow, reminding her with a sand clock that soon enough she too will come into his arms. 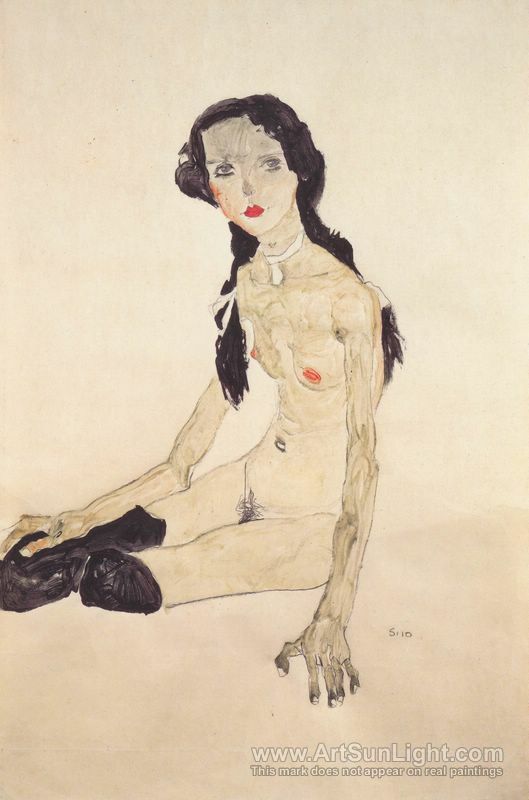 Happy Halloween, with Schiele and Death! “You are the knife I turn inside myself; that is love. 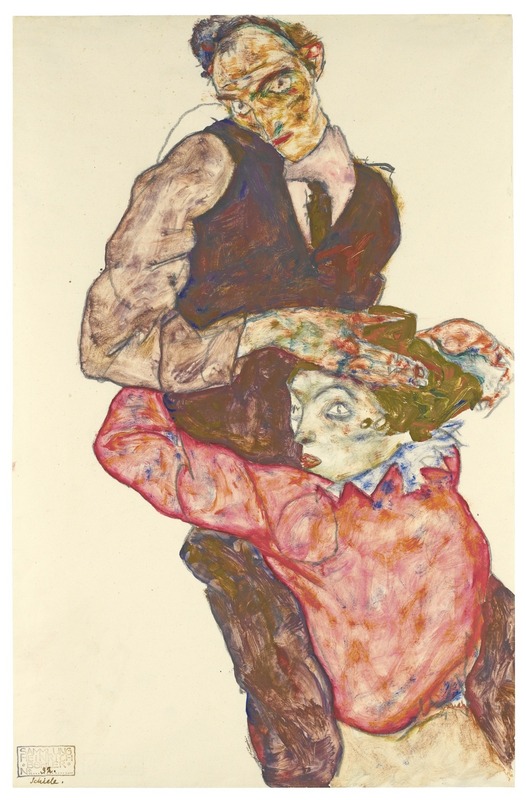 That, my dear, is love.” – this is what Kafka wrote to the mysterious Milena, and isn’t this sentence alone, with Kafka’s vibrant expressionistic definition of love, enough to lure you into reading the book? In 1920, Franz Kafka and Milena Jesenská began a love affair through letters. Kafka is a well-known figure in the world of literature, but who was Milena? 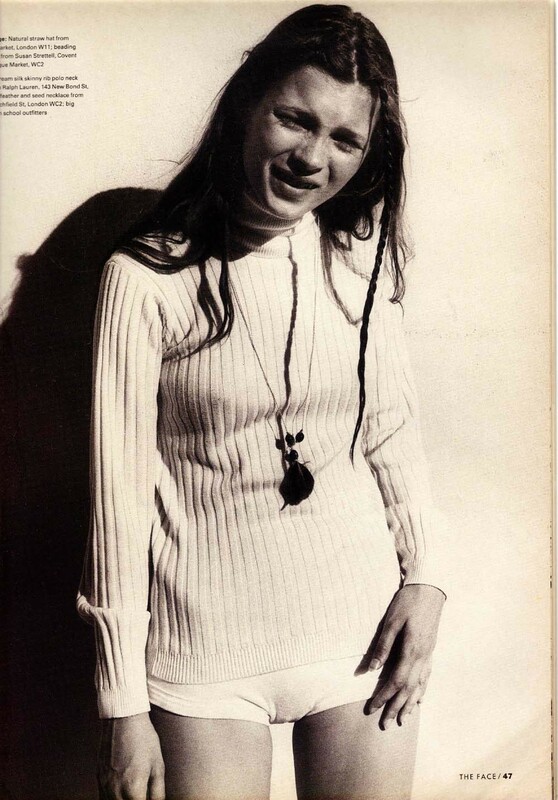 Milena was a twenty-three year old aspiring writer and translator who lived in Vienna in a marriage that was slowly falling apart. She recognised Kafka’s writing genius before others did. 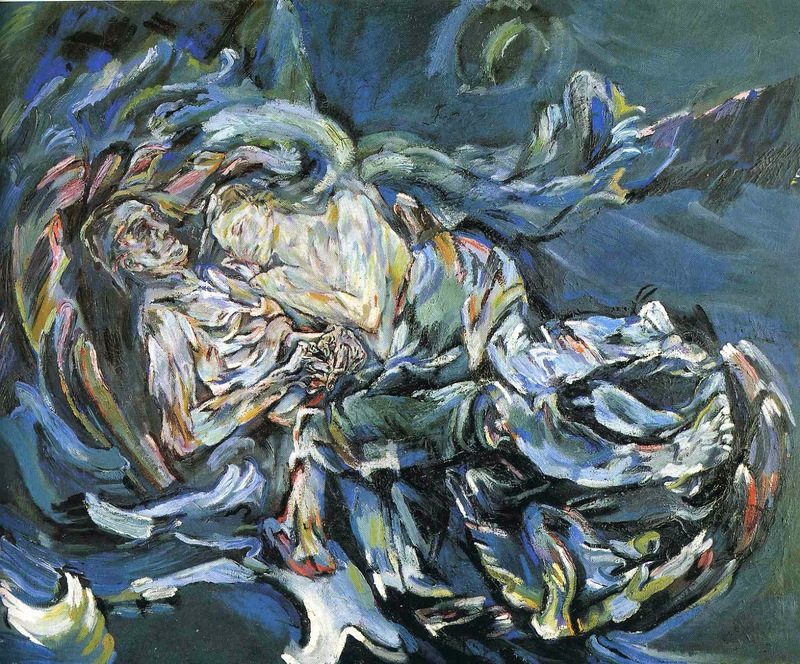 Despite the distance, despite the turbulent sea with insurmountable waves between Kafka in Prague and Milena in Vienna, the two developed an intense and intimate relationship. They stripped the masks of their bourgeois identities and bared their souls. The correspondence started when Milena wrote to Kafka and asked for a permission to translate his short story “The Stoker” from German to Czech. Such a simple request and formal demand very soon turned into a series of passionate and profound letters that Milena and Franz exchanged from March to December 1920. Kafka often wrote daily, often several times a day; such was his devotion. This is what he tells her: “and write me every day anyway, it can even be very brief, briefer than today’s letters, just 2 lines, just one, just one word, but if I had to go without them I would suffer terribly.” The letters are interesting from a linguistic point of view as well; Kafka wrote his letters in German while Milena wrote most of hers in her mother tongue, Czech. I found it really interesting to know that Kafka was fluent in Czech. 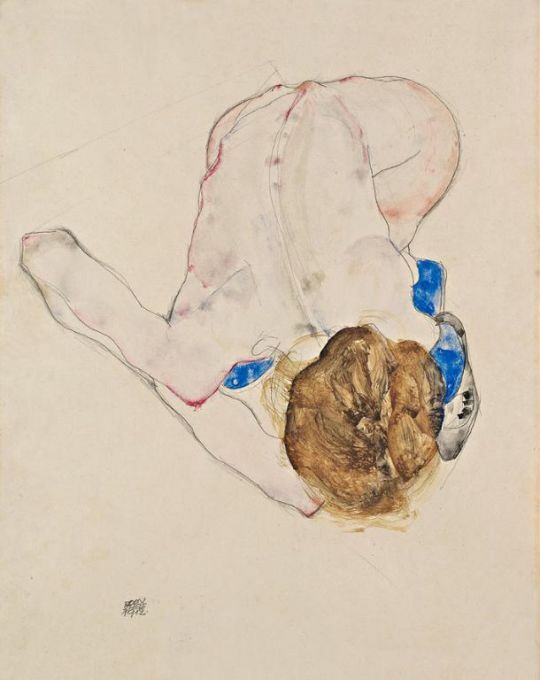 Although Kafka confided to Milena about his anxieties, fears, loneliness, it wasn’t all honey and roses; Kafka’s letters revealed the extent of his anguish caused by Milena, the sleepless nights, and the futile situation of their love. Milena haunted his thoughts, but he wasn’t the only one to suffer. 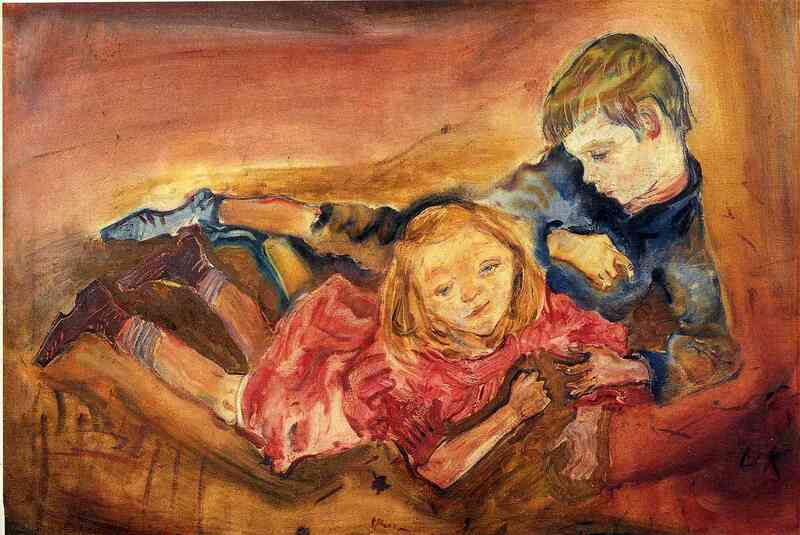 In the introduction to letters Williy Haas describes Milena as a caring friend inexhaustible in her kindness and a desire to help. Kafka later writes to her calling her a ‘savior’. Passionate, vivacious and courageous, Milena suffered greatly nonetheless because of him, as Kafka said himself: “Do you know, darling? 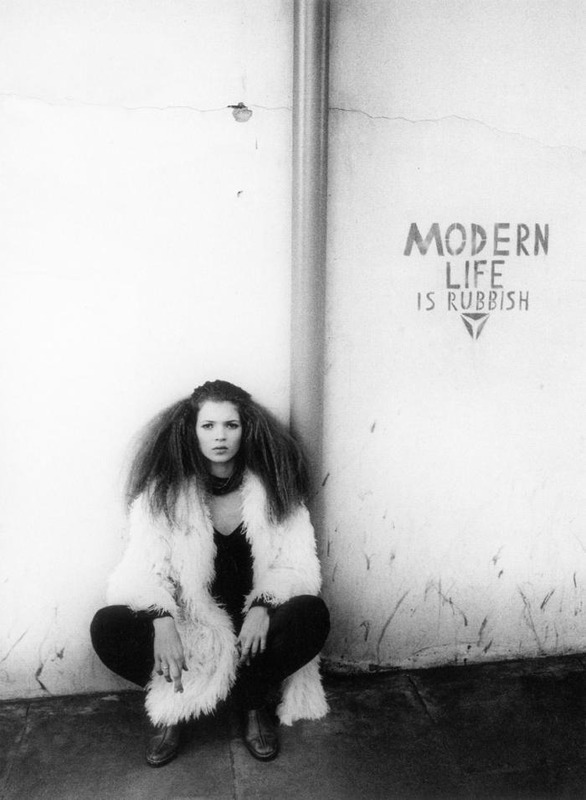 When you became involved with others you quite possibly stepped down a level or two, but If you become involved with me, you will be throwing yourself into the abyss.” She must have known that herself, and yet she chose to sink because ‘lust for life’ was part of her personality, and pain and rapture go hand in hand. Haas also reminds us that Dostoyevsky was her favourite writer and that we also mustn’t forget the propensity towards pain which is so typical for Slavic women. Slavic soul is a deep and dark place, one you better not wander into out of mere curiosity. It is almost hard to imagine how two such strong, profound, dark souls could even live a simple life together. Their relationship was of a hot-cold character; intense at one moment because their minds were alike, then alienating the other because of the distance. When one side was attached, the other cooled down, and vice versa. 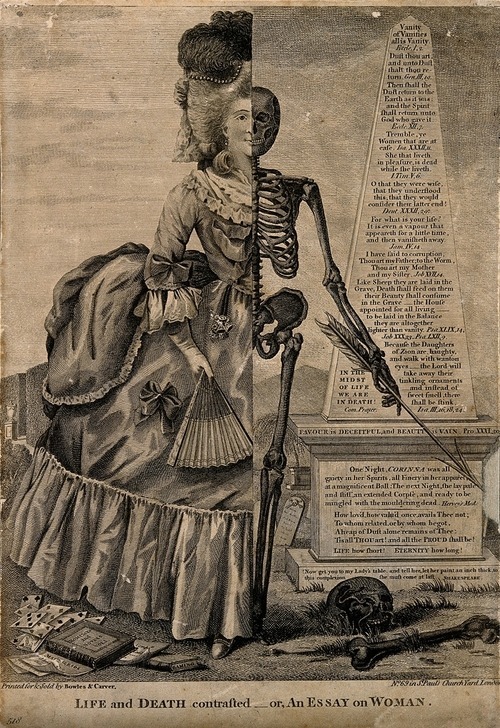 When she yearned to see him in Vienna, he was reluctant; when he wanted her to divorce her husband and come live with him, she wasn’t keen to do so. They met only two times in real life; on the first occasion they spent four days together in Vienna in June 1920, and the second time, in August 1920, they only met briefly in Gmünd on the Austrian-Czech border. It was Kafka who broke off the relationship because the situation seemed too pointless; they lived far away and Milena wasn’t willing to abandon her husband. They exchanged a few more letters throughout 1922 and 1923, but they were more reserved in nature and fewer in number. 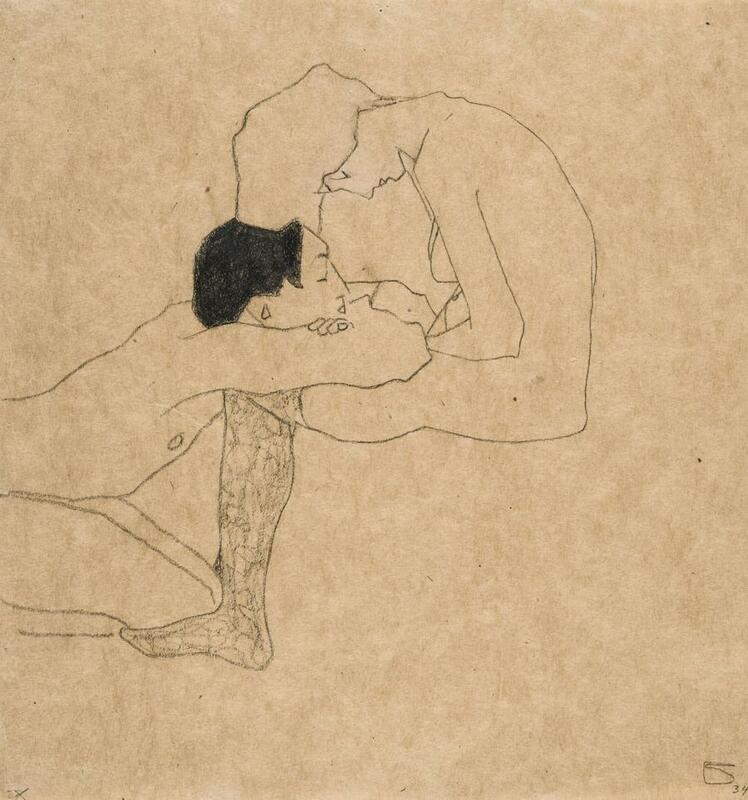 He tells her: “Go on caring for me.” In 1924, Kafka died. 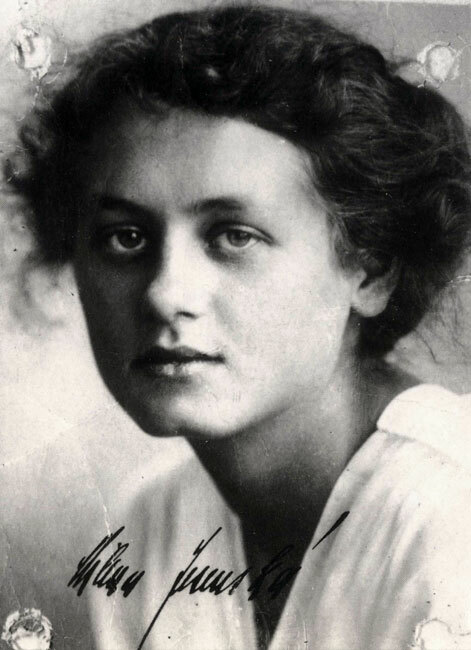 Milena died twenty years later, ill and alone in a concentration camp. Kafka’s “Letters to Milena” left a scar of Beauty on my soul. I enjoyed the book tremendously. Since Kafka as a person and his work are both pretty dark, I was amazed to see a tenderer, loving side of his personality, and to be inside his mind. I started reading the book thinking ‘this is interesting’, but as I turned the pages I felt more and more drawn in by his words. It’s hard to explain, but they touch me right in the heart even though they were not meant for me, just like a sewing needle pierces your skin and causes a sharp and burning pain which lasts for a second but leaves an echo. Kafka’s words, in the letters as well as in his stories, are simple at first reading, but they stir the waves inside me after I close the book. I hope this post inspires you to read the book. As of 2017, I have been immensely interested in letters, diaries and memoirs. The depth of feelings and the aspect of sincerity and intimacy in those literary forms just wins me over. So, if you have any suggestion about correspondences I should read, feel free to tell me.